In the middle of July, scouts from both Pack 353 and Troop 353 participated in water sales on the day of Tuckahoe Village’s huge fireworks extravaganza! The streets surrounding Parkway Oval are blocked off and various street vendors set up their stands for food, face painting and other friendly activities. A DJ is hired and bands perform on the large stage. The event is a very popular one and draws thousands on a hot steamy summer night. 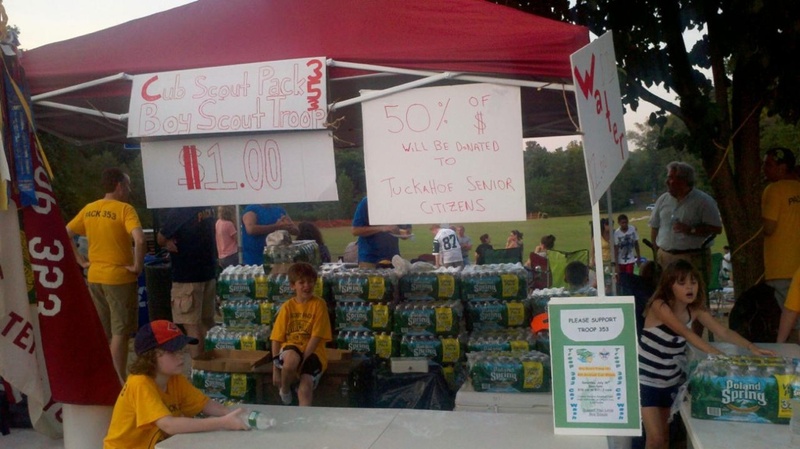 Scouts sold chilled water and donated one-half the proceeds to the senior citizens of Tuckahoe. A check for $250 was presented to representatives of the senior citizens before the Tuckahoe Village Board. Scouts from both Pack 353 and Troop 353 also led an opening flag ceremony at the Village Board meeting that night in late September. A Scout is Helpful! More photos are found here!